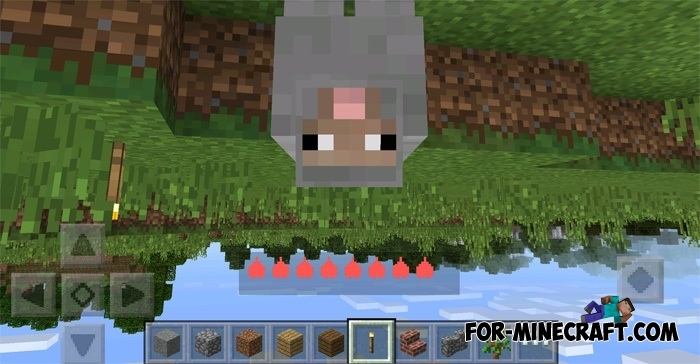 By installing AJMods MCPE mod, you can take advantage of new features in the world of Minecraft Pocket Edition - some of them are really unique, and you will not find similar features in other versions! Among the functions there is a pause mode, the ability to climb walls, walk on liquid - water and lava and many other features! It is worth noting that this cheerful mod is both a cheat. For example, if you are connected to the other players, and you are the creator of the world, then you will be able to use all the features of AJMods, and your friends will not be able to do it. Now we will tell you how the most fun and useful features are working. You can choose any of the functions in a special cheat menu, which can be opened by clicking on the new button in the upper right corner of your screen. Walk on liquid function will allow you to move freely around the body of water and lava, and you will not receive any damage or drown in water. This feature is perfect for those players who do not like to swim. Moreover, in such a way it will be much faster to overcome a certain distance of the sea. There are situations when you escape from aggressive monsters who want to attack you. You have built a base for shelter but the entrance is too far away, and the monsters almost have surrounded you. You can explode the wall of shelter but with the Wall climbing function, you can simply climb up the wall! Pause or Slow features are also very useful, because one of these stops time in Minecraft PE, while the other slows it. Thus if you were attacked by a zombie, you can simply slow down time and destroy enemies. As you can see in the screenshot, there is also an indicator of health. You can enable or disable it in the settings mode. You will also see the Upside Down Screen function, and it is really unusual! I wonder, one of you will be able to survive at least one night when your world looks upside down? Also, there is also a camera and in addition to this - the ability to spawn a growing star and alien!